One of the most important decisions you will make in the lifetime of your kitten is to decide on its nutritional needs. This may not always be a simple choice since there are so many options available to the discerning pet parent today. In this article we are not only going to cover how much wet food to feed a kitten per day, but we will also discuss the differences in food quality and what you should look for when choosing a brand. According to PetEducation, there are some key ingredients your kitten will need. First of all, cats at any stage of life are carnivores, so their diets need to be filled with a good-quality protein. This can be sourced from meat, poultry or fish. Protein is essential in the development of muscles, tissues and the brain function of your feline. In addition, taurine is vital to the health and well being of the feline species. This amino acid cannot be manufactured in this animal’s body, so it must be utilized from its dietary intake. Where is taurine best utilized from? You guessed it. In meat, fish and poultry. According to PetMD, a lack of this important amino acid could lead to a taurine deficiency in your cat which will affect its heart, eyes and brain. When choosing any cat food, whether it be wet, dry or semi-moist, the first ingredient should be a good quality protein sourced from a real meat, not a meat by-product. Also avoid foods that contain a lot of grain or fillers as these are cheap substitutes that companies use to bulk up the food, rather than use good nutritional ingredients. It’s recommended to feed the best food your budget will allow. Quality wet cat food will not only keep your cat fuller for longer (cutting down on the portion sizes) but will aid in its digestion, give it a healthier coat and help prevent many diseases. In addition, be sure to choose a cat food that is specifically made for kittens. Kitten food is higher in protein, providing your fur baby with the added nutrients and energy it needs to grow and be active. There’s no one answer to the question. This all depends on the age, size, individual cat and if it is it’s only dietary option. Generally, growing kittens should be on a schedule. This allows you to control his dietary intake (which becomes more important later on in life) to avoid becoming overweight. Your kitten should eat three times-per-day; morning, afternoon and evening. Read the package to determine what it recommends per-pound, per-day then divide that portion up into three equal meals. The label is a good starting point when determining how much wet food to feed a kitten per day, but your individual cat will tell you if it’s too much or too little. For example, if he is gobbling up his food and always seems hungry with little to no weight gain, you may want to increase the amount and conversely offer less if he’s beginning to gain too much weight. Also take into account whether your kitten is too lean or perhaps even too chubby (which is very rare for kittens). 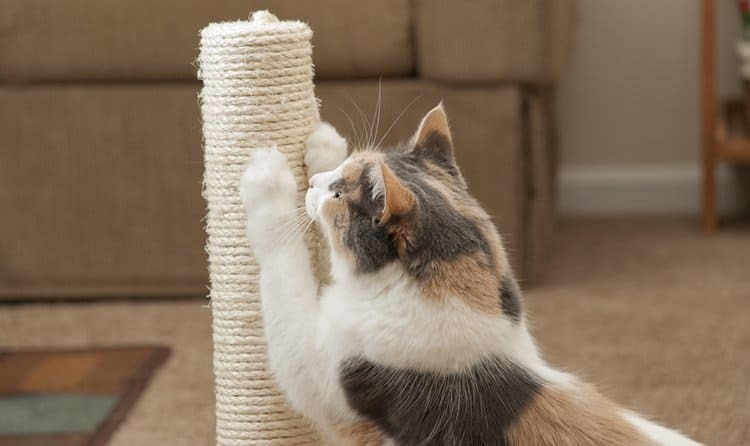 If she needs a bit more weight see our tips on how to fatten up a cat. Cats that eat a consistent diet of wet food should be given daily crunchy treats to help reduce the amount of tartar build up on their teeth. Some pet parents also opt to mix a wet food into the dry kibble for both moisture and an extra kick or protein. How much Wet Food for Adult Cats?